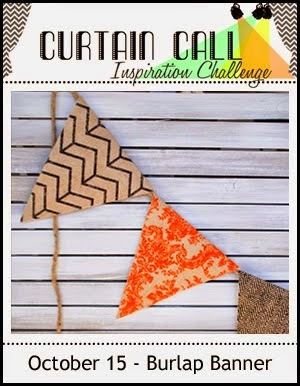 I made this card for the current Curtain Call Challenge - Burlap Banner. Of course, I was inspired by the burlap banner and that orange color in the middle panel. I just cut some burlap into triangles, then cut some decorative paper into slightly bigger triangles and glued them together to make the banner, The green jute string is from Tim Holtz. The patterned papers are all from the Studio Calico - South of Market paper pad. I made the bird from a Media Mixage die. I outlined the card and the bird with an orange Stamper's Big Brush Pen. Finally I added the letters to the banner. It's a simple card, but it was really fun to make and I like how it turned out. Thanks for stopping by! Adorable card :) A big congrats on getting the burlap bits on the banner without them falling apart!! Thanks for joining us at The Curtain Call. This would have taken forever Donna, love that burlap that you added to the banner! 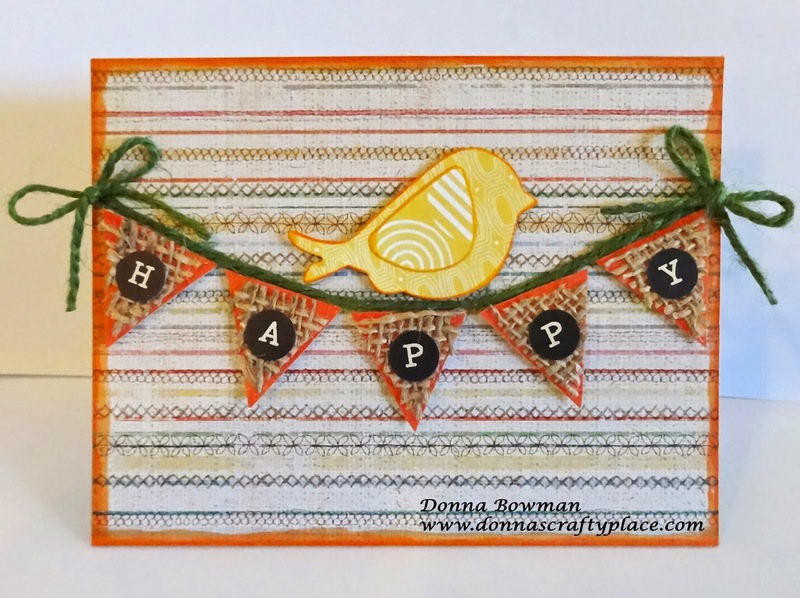 Donna this is so pretty.. love that banner and the little bird is perfect.. great card.. LOVE!!!!! Thanks for playing along at the Curtain Call!!! this is beautiful! that mini banner is so fantastic! What a wonderful card. Love the burlap banner and the sweet bird sitting on it. What a great take on the picture. Thank you for playing along with us at the Curtain Call Inspiration Challenge. Sooooo very sweet! Thanks for joining us at the Curtain Call!